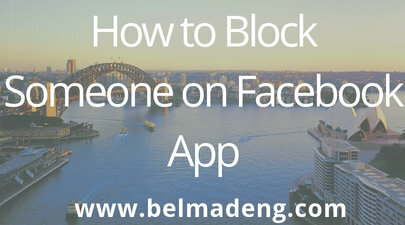 How to Block Someone on Facebook App: This Facebook tutorial will show how to block someone on facebook without them knowing. So if you're looking for an answer to the question; "how do you permanently block someone on facebook?" this post got you covered. Okay, let's get started with how to block someone on the Facebook app. Facebook recommends you block people who you longer want to befriend on the site. However, one thing that is worthy of note is the fact that blocking on Facebook is a two-way thing. It's a two-way thing in the sense that, when you block someone from accessing your profile, Facebook also unfriend or block you from seeing stuff the person is sharing too. Additionally, according to the Facebook Help Center, when you block someone on Facebook, you also won't be able to do things like start a conversation with them or add them as a friend. Note that blocking someone may not prevent all communications or interactions (example: in apps or groups) and only affects your interactions with that person on Facebook. 4. Tap Add to blocked list and enter the person's name. 5. On the search results page that appears, find the person you want to block and tap Block > Block. 4. Next, choose Blocking in the left side menu. 5. Enter the name of the person you want to block and click Block. 6. Select the specific person you want to block from the list that appears and click Block > Block [name]. Facebook recommends banning people who continually publish spam on your Page. You can choose to unban them at any time. You can block people from your Facebook page in different ways. It could be via your page settings, comment, post, inbox, and from where your page is being mentioned. 2. Click People and Other Pages in the left column. 3. Search for the person or click to check the box next to the name of the person you want to ban. 4. Click the gear shape icon and select Ban From Page. 1. Hover over a comment by the person or Page you want to ban and click the three-dotted icon. 1. Click Posts in the left column of your Page. 2. Click Visitor Posts on the right side of your Page. 3. Click the three-dotted icon in the top right of the post by the person or Page you want to ban. 4. Select Ban From Page and click Confirm. 1. Click Inbox at the top of your Page. 2. Click the message on the left from the person you want to ban. 3. Click the three-dotted icon in the top right and select Ban From Page. There are several ways to unban a person or another Page from your Page. 3. Click People Who Like This Page and select Banned People and Pages. 4. Click to check the box next to the name of the person you want to unban. 5. Click the gear shape icon and select Unban From Page. 2. Click the message on the left from the person you want to unban. 3. Click the three-dotted icon in the top right and select Remove ban from Page. 2. Tap the circular icon with an i-sign at the center, scroll down, and then tap Block. Note: If you unblock someone on Facebook, you won't be able to block them again for a few days.